Romeka Maxwell looks out the window of her house on Catherine Street. It’s a pretty day. The sun’s out and the wind rustles through the trees. She looks below at her elementary school-age daughters — 9-year-old Linda and 5-year-old Diamond — as they run around the grass with some other children Maxwell is babysitting. “I’m mad mom sent them outside, and why she’s not outside?” Maxwell says loudly so her mom can hear her from the kitchen, not taking her eyes off the window. “I am going! I am going!” her mom says from the kitchen. Maxwell continues to peer out the window for the next few minutes, until her mom walks out the kitchen, down the stairs, and out their front door into the sun. Maxwell, 28, calls herself an overprotective mom. She grew up in Syracuse and says she has lived on every side of town. In just the past decade, she has occupied four different subsidized apartments — always vigilant for the kids, no matter how safe or unsafe each neighborhood may seem to have been. “(I’ve) always been that way. It’s not because I’m staying here. Even when I stayed in Eastwood, and we see nobody riding up and down the street. I just trust nobody,” Maxwell said. It might have to do with the suspected house of prostitution that used to be down the street. Or with her own life’s path since she first started out as a single mom at 19, a high school dropout. Still, it’s better now, as better goes. Her apartment on Catherine Street is a little over two miles from Burger King on Erie Boulevard, where Maxwell has worked for the past two years. Maxwell used to walk or take the bus to work, but she just bought her great-grandmother’s car, a 2005 Dodge Stratus, a little over a month ago. It gives her freedom. 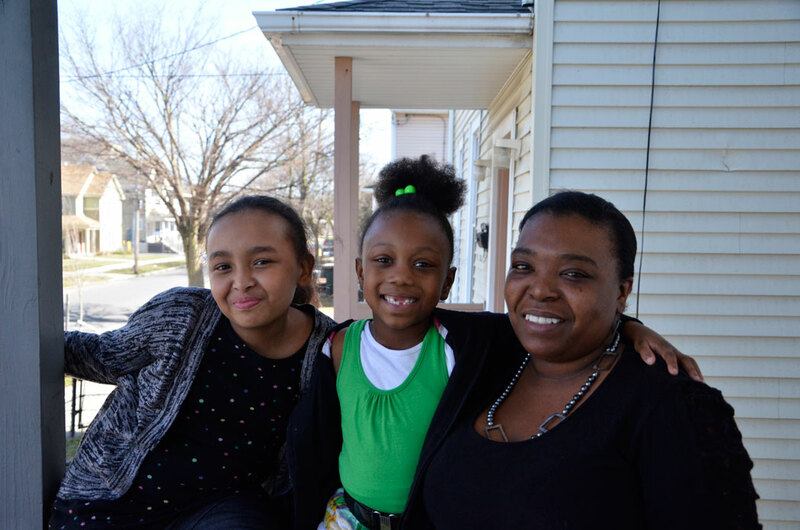 Her daughters attend Southside Academy, a charter school affiliated with the Syracuse City School District, where she says she’s proud of the education they receive. But Maxwell still worries about her bills, despite paying just $100 a month out of her own pocket of the $593 owed monthly on the apartment on Catherine Street. The subsidy is part of Section 8, administered through Christopher Community, Inc., a nonprofit. Maxwell also receives food stamps, as do 46 percent of households in her neighborhood. Maxwell has every reason to be stressed. She makes just $8.75 per hour at Burger King, minimum wage for New York state, and works around 38 hours each week. When it comes to having enough money left over for her other bills, she has a certain payment process. “I go by whatever bill is due first,” she said, laughing. Section 8: What is it, and how well does it work? Section 8, or the tenant-based rental assistance program, allows households to move to better neighborhoods by providing them with housing vouchers that assure they’ll have to pay no more than 30 percent of their income toward rent. Under Section 8, a landlord with a tenant on Section 8 is paid the difference between market rent and 30 percent of the tenant’s income. By obtaining a voucher, families can search for housing with better economic and educational opportunities, but oftentimes they have difficulty finding a property that will take Section 8. In a local survey, of 712 housing advertisements on Craigslist, only 25 said they would take Section 8; 94 said they prohibit Section 8; and 593 were silent on the issue. One concern with Section 8 housing is that the majority of households with vouchers live in areas of low opportunity. Some 66 percent of households with vouchers are in areas with very low or low housing opportunity and only 12 percent live in areas of high opportunity. For educational opportunity, 68 percent live in areas of low or very low educational outcomes. Families with housing vouchers do better in economic opportunity. But 48 percent are still in areas of very low or low economic opportunity, whereas 35 percent are in areas with high or very high economic opportunity. The voucher program is in place to help households move out of areas with low opportunities, yet it falls short of that goal. Public transportation is a large factor in limiting housing options for people. If they depend on public transportation, they have to find a home where it is easily accessible. Access to public transportation is limited in areas of high opportunity, where most people have cars instead. And where such access exists, it can be unreliable. Recommendations to help alleviate the burden of public housing are to deliberately link the development of affordable housing to public transportation and place affordable housing in areas where cars are not required to access services; explore creating special Call-A-Bus service districts; and identify and eliminate gaps in bus services in neighborhoods of better opportunity. Onondaga County’s only public transportation option is CENTRO. It is accessible within Syracuse, but is mostly cut off from the outer suburbs, where better jobs may be available, or work on second or third shifts may be offered. That leads to a low economic opportunity ranking for those who live in the city and rely on public transportation to get to work. In recent years, several housing projects have been built in communities where there are no retail or other job opportunities within walking distance, and there is little public transportation. Her North Side neighborhood on Catherine Street is made up of 63 percent minorities, and most have little. Maxwell is one of 677 people living in poverty among the 1,800 city residents who live on neighboring blocks in her Census tract. The median household income is a mere $21,197; Maxwell’s income is even lower, still, an estimated annual $17,290 or so, varying according to how much she might work each week over the course of a year. Only 20 percent of adults in the tract 25 years or older have a college degree. Maxwell isn’t one of them. 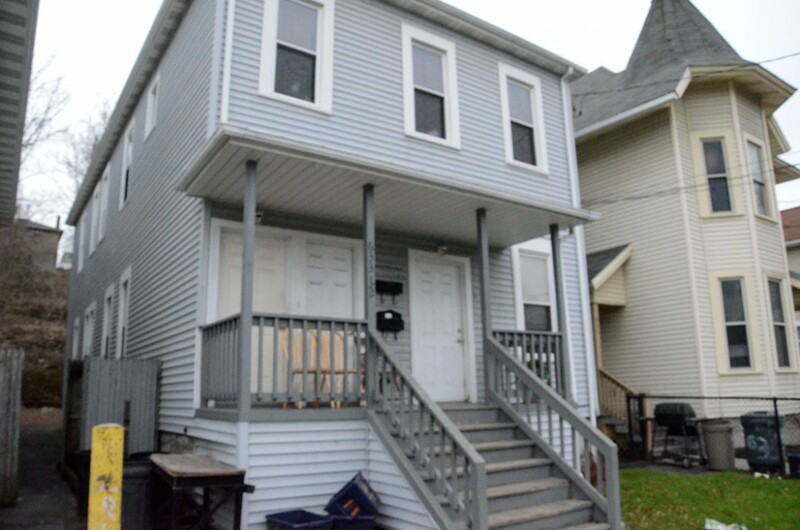 Maxwell’s neighborhood is low-income and filled with others like her, a trend that’s the norm for African-Americans in Syracuse, according to a Central New York Fair Housing report from fall 2014. Citywide, some 84 percent of African-Americans live in areas with “low” or “very low” educational outcomes compared to just 21 percent of whites. Many African-American children, like Maxwell’s, are also going to school with other students who come from poor areas and look like them, isolating them even further. An average African-American student goes to a school that is 49 percent African-American and only 36 percent white, while an average white student attends a school that is 88 percent white and where 32.4 percent of students are considered low-income. An average African-American student is likely to go to a school where 68.7 percent of students are considered low-income. Children going to school in the city school district are also around other students who aren’t performing as well in school compared to the suburbs. Only 28 percent of students in the Syracuse City School District are fourth-grade reading proficient and just 35 percent of students are fourth-grade math proficient. Before Maxwell moved to Catherine Street, she lived in Eastwood, where her landlord was absent and didn’t keep up the house. Now her apartment is kept nice, but she still worries about her neighborhood’s safety for her kids. 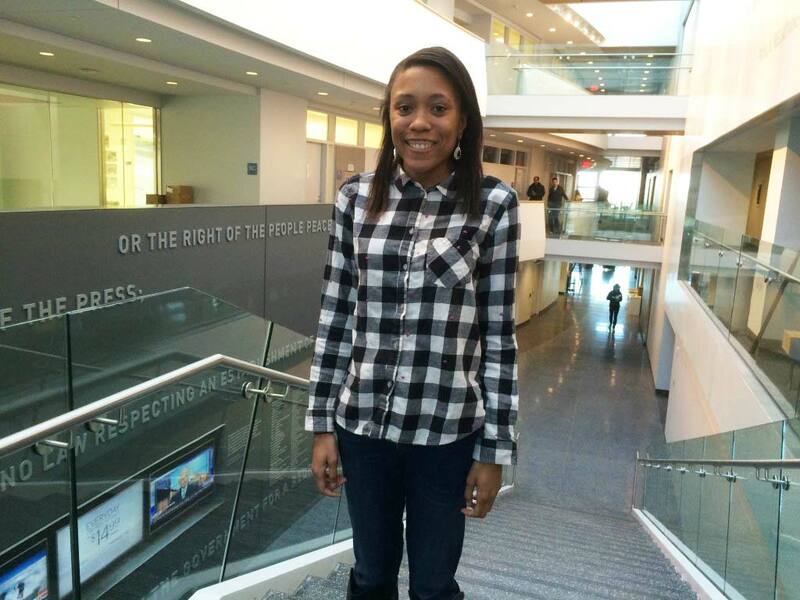 Maxwell just got her GED in 2013 through SUNY’s Educational Opportunity program in Syracuse. She still wants to go for her associate’s, then bachelor’s, and eventually move into her own non-subsidized house. Maxwell said she was a good student at first and liked going to city schools. She lists them diligently: Delaware Elementary School, Shea Middle School (now Bellevue Middle School), Lincoln Middle School, Fowler High School. Fowler is where trouble began, when Maxwell started hanging out with the wrong crowd, a path perhaps not unexpected in a school where, in 2014, the graduation rate was a dismal 30 percent. Around 2005 and at 19, Maxwell ended up pregnant by her high school boyfriend. She dropped out and gave birth to her oldest daughter, Linda, now 9. “I was already not used to getting up and going to school anymore. I just kept trying it. I wasn’t into it anymore,” Maxwell said. Shortly after, she moved into a two-bedroom subsidized apartment on the corner of West Street and Onondaga, where the rent was adjusted based on income to $125 with no utilities. “I felt bummed because everything was ruined … but then after I had her, it was like a blessing. I figured I can deal with her now, and then eventually I’ll go back (to school),” Maxwell said. She started working at Production Products Company, a company making parts for the cable industry, for just $8.25 an hour for 40 hours a week, sometimes more. Maxwell’s first job had been at Brady Faith Center, a church and community center on the South Side of Syracuse. She says Brady is her home church, where three generations of family members have attended or currently attend. Her mom has worked summer programs there. Maxwell has, too, and also assisted with the after-school programs. “It’s like another home. They don’t judge you on how you look or how you dress. If you’re smart, if you’re not smart. They don’t pass judgment. I don’t know, we just feel comfortable,” Maxwell said. Mary Bennett, Maxwell’s aunt, has watched Maxwell grow up in the church and continue to stay actively involved at Brady into her 20s. She remembers watching her mom, Maxwell’s grandmother, take Maxwell to church on Sundays. “Romeka did quite a bit for the Catholic church. Actually she has always been a giving person, she (does) whatever she can for anyone. In fact, sometimes she (does) too much,” Bennett said. Maxwell started receiving Section 8 subsidies shortly after she left her apartment on West Street, when she and her boyfriend decided to break up. Maxwell was on her own. With her oldest daughter, she decided to move to Courtyard apartments on the corner of James and Catherine streets. Her landlord told her if she stayed in the apartment for a year, then she could qualify for Section 8. She was grateful. But Maxwell didn’t have a car and had to rely on a bus to make it to work at her factory job at Eagle Comtronics in Liverpool. The bus she needed came at 5:40 a.m. — and then the next one not until 1 p.m. She said trying to catch the early-morning bus to make it to work in time was tough. 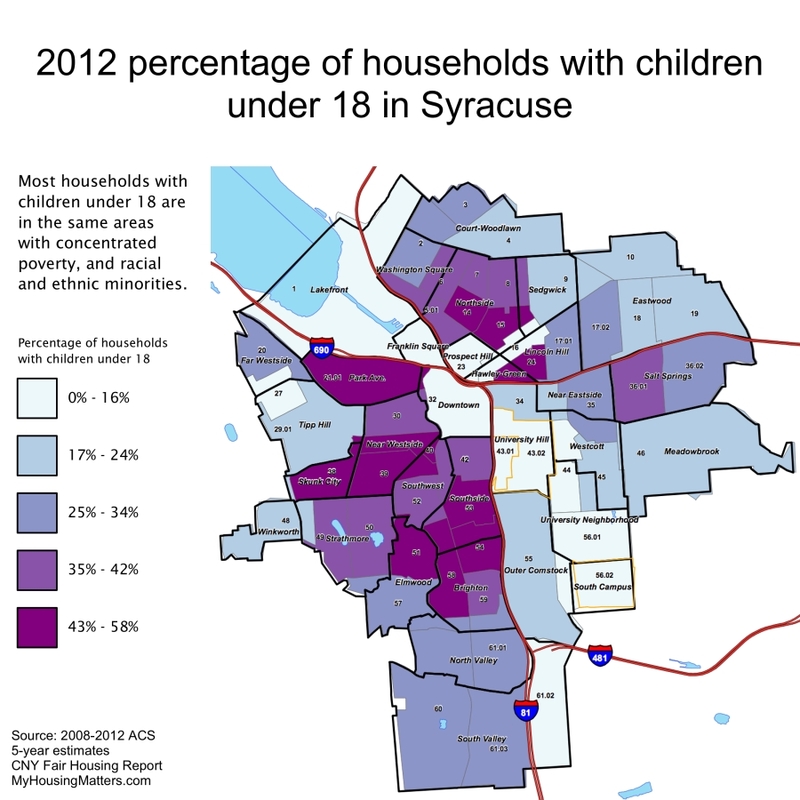 As the Central New York Fair Housing report from fall 2014 notes, public transportation is a problem for many residents in subsidized housing, the vast majority of which is in the city. In the Census tract that includes Catherine Street, only 47 percent of households have access to at least one car. For those who find jobs commuting to the suburbs — or would like to, as Maxwell did in Liverpool — it’s a struggle without a car, though jobs outside the city may offer a better salary and a better future. Maxwell’s experience with Section 8 has been mixed. When she lived at Courtyard apartments, she was in and out of work and Section 8 was paying around $200 or $300 of her $500 rent. When she struggled to find work, Section 8 paid the $800 for her rent in Eastwood, even though it kept failing Section 8’s housing inspections. The outside of the apartment needed to be scraped and re-painted. A wobbly railing needed repair. But Maxwell’s absent landlord was never around to make the changes. When her landlord finally did send someone out to fix it, it still wasn’t up to Section 8’s standards. Section 8 told Maxwell that either she would have to pay the $800 rent herself or move out. Maxwell moved to her current house on Catherine Street at the end of 2011. Christopher Community Housing called Maxwell after she had spent two years on a waiting list. Last school year, her daughter Linda’s school bus stop was right in front of a suspected prostitute and drug house. Maxwell remembers seeing cars stop by the house and people walk up and down the street. She made a call and got the bus stop moved to the other side of the street. The house was boarded up this past winter. Maxwell mainly works the cash register at Burger King six days a week: six-hour shifts on Mondays through Fridays, and one eight-hour shift on Saturdays. Work doesn’t pay a lot, but it’s a release as well as a paycheck. Last winter, Maxwell struggled with waiting for the bus for work. She would wake up early to walk her two daughters to their bus stop, then walk over to her own stop to get to Burger King. Now, with a car, she enjoys her quiet times in the morning, sitting in silence and drinking a cup of coffee. 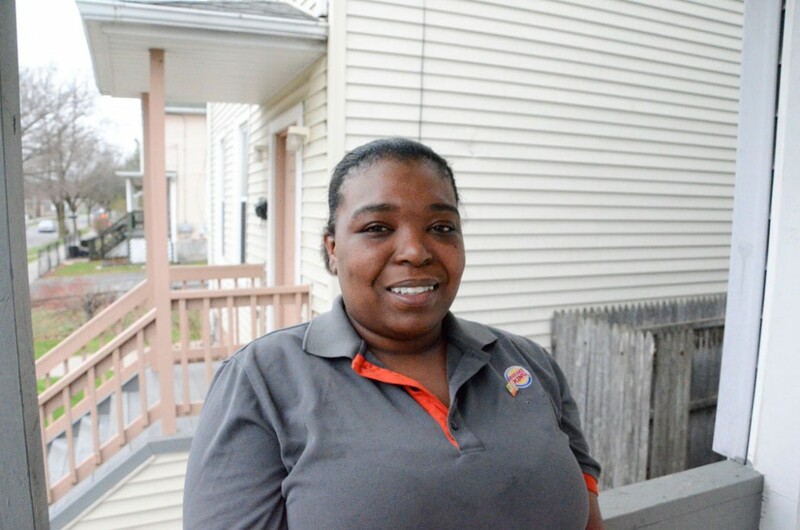 Since Maxwell dropped out of high school 10 years ago, Burger King has been her longest job. She went through a lot of temp jobs at factories before taking the test to get her GED. She remembers being nervous on test day and the advice of the woman who helped sign her up for the exam. It still took her almost half a year to find a job. Burger King was the only offer. She enjoys talking to the customers and likes to work at the cash register, but sometimes helps out in the kitchen. Maxwell’s own struggle with education and finding a job is one she doesn’t wish on her daughters, and it was motivation to enroll them at Southside Academy Charter School. It might help them shatter the low outcomes their neighborhood’s Census data suggests. Maxwell filled out an application for Linda when they moved to Eastwood. Children go through a lottery system, and if they aren’t chosen, then they’re put on the waiting list. Linda was on the waiting list, but found out she could go to Southside on her second day of kindergarten at Huntington. Her younger sister, Diamond, followed. “I just like the way they challenge their brains. It makes them think. … If you ask me, they’re more advanced than the city school district,” Maxwell said. Maxwell also thought it would be less “drama” compared to the public schools. However, she said her oldest daughter has started having some problems this year. There are only two charter schools in Onondaga County: Southside Academy Charter School and Syracuse Academy of Science Charter School. Southside Academy serves 687 students entering kindergarten through the eighth grade. Some 82 percent of students at Southside Academy are African-American, and 90 percent of students are economically disadvantaged. Syracuse Academy of Science is also for students entering kindergarten but continues until 12th grade. To gain admission into either school, students must fill out an application. A lottery is held if there are more applications received than available spots in each school. Syracuse Academy of Science, open since 2003, focuses on STEM education for around 700 students. The school is pretty diverse, serving 44 percent black students, 17 percent Hispanic or Latino, and 23 percent white. Some 67 percent of students are economically disadvantaged. The school’s graduation rate is 84 percent compared to 51 percent for students who graduated in 2014 from the Syracuse City School District. She continues to raise her daughters by herself, with some help from her mom and sister, but that isn’t unusual for the city of Syracuse. Some 21 percent of households are led by a single mom. Bennett, the aunt, says Maxwell is a good mother. “She takes the children over herself. That’s important to me because I love children and I like to see young people have fun, but at the same time take responsibility for whatever life brings them,” Bennett said. Maxwell’s oldest daughter still visits her dad, who lives in New York City, in the summers and during some other school vacations. Her youngest daughter’s dad isn’t in the picture. “I want to say it’s hard because I don’t give them everything they ask for. That’s one big thing. That’s what I have to teach them. They can’t get everything they want. They can get what they need,” Maxwell said. Maxwell was 29 this May and has a lot of hopes for her future. “When I was little, I always wanted to be a pediatrics nurse. Then as I got older, I started seeing where all the money was in nursing. I might still be an RN. I just don’t want to work in the nursing homes. I don’t want to work with adults. I love working with kids. That’s a lot of schooling (though). I’m not into school anymore. I don’t have the patience,” Maxwell said. She sees the brightest future for her daughters.